SEC baseball tournament bracket update: What are the Vols’ scenarios for this weekend? KNOXVILLE, Tennessee — To make its first trip to the SEC baseball tournament since 2007, Tennessee needs to win two games this weekend against Florida or else keep an eye on what’s happening at Auburn. Or maybe Athens. And we’re not even going to mention College Station. With three games left in conference play, the Vols (29-20, 11-16 SEC) are the 11th of 12 seeds in next week’s SEC tournament in Hoover, Ala.
Tennessee has a half-game lead over 12th-seeded Georgia (10-16-1) and a one-game lead over Auburn (10-17), which would fail to make the tournament if it started today. Georgia hosts 10th-seeded Kentucky this weekend, while Auburn takes on No. 6 seed LSU. For the sake of simplicity, we’re viewing this as four teams (UK, UT, Georgia and Auburn) vying for three spots. (Texas A&M and Arkansas are both 13-14, but adding them to the mix would be insanely complicated and I’m not sure it would make a difference). * UT sweeps Florida, 3-0. The Vols (14-16) are in. * UT wins two of three from Florida. The Vols (13-17) are in. * UT is swept by Florida. The Vols (11-19) are in if Georgia is swept OR Auburn is swept OR if both Kentucky and Auburn are swept. * Kentucky clinches with one win over Georgia or one Auburn loss to LSU. The Wildcats are eliminated if they are swept AND Auburn wins all three games AND Tennessee wins at least one game. * Auburn clinches with a sweep. They are eliminated if they are swept. At 2-1, Auburn gets in if Georgia loses at least two games OR if UGA loses at least one and Tennessee is swept OR if Kentucky is swept and Tennessee loses at least twice. At 1-2, Auburn can only get if Georgia is swept OR if Georgia wins at least two while Tennessee is swept. * Georgia clinches with a sweep. With two wins, the Bulldogs will be in unless Auburn sweeps LSU AND Tennessee wins at least two. With one win, the scenarios are very complex. If the Bulldogs are swept, they get in only if Auburn is also swept. You can follow the rest of the bracket here (.pdf file). If Tennessee makes the SEC tournament, then the questions will turn to the possibility of an NCAA regional appearance. But that’s for another blog. The Vols host Morehead State on Tuesday night. If it’s not a must-win game, it’s at least a must-not-lose game. Bad mid-week losses are never good things for an NCAA bubble team, and the Vols already took one last week against UNC-Asheville. This entry was posted in UT Athletics and tagged BaseVols, SEC baseball tournament on May 13, 2014 by Evan Woodbery. KNOXVILLE, Tennessee — Tennessee’s series-clinching victory over Kentucky on Sunday was doubly meaningful for the Vols. At 10-14, Tennessee now wins the tiebreaker over Kentucky and climbs to the No. 10 seed in the SEC tournament. The recent struggles of Auburn, Missouri could give the top 12 teams a bit of a buffer in the league standings. I think 11 of the league’s 14 teams have NCAA-quality resumes. (Everyone except Georgia, Auburn and MIssouri.) That could create a lack of suspense in Hoover, Ala., particularly if the bubble team(s) are bounced quickly in the single-elimination portion. Tennessee has six SEC games remaining — three at Mississippi State and then three at home against Florida — and two non-conference games. If the Vols go 4-4 in that stretch, their projected RPI ranking would be 37th. While that would probably be enough, although UT would prefer a bigger cushion. This entry was posted in UT Athletics and tagged BaseVols, SEC baseball tournament, Tennessee baseball on May 6, 2014 by Evan Woodbery. KNOXVILLE, Tennessee — Twelve of fourteen SEC teams make the conference tournament in Hoover, Ala., so the accomplishment isn’t necessarily worth celebrating. But given the competitiveness of the league this year (and every year), there’s a chance that a team with an NCAA-quality resume could be left out. And that team could be Tennessee. The Vols took one of three from LSU over the weekend in Baton Rouge to improve to 8-13 in the conference. Missouri (6-15 in the SEC) continued to struggle, and will have to fight its way out of the No. 14 slot. That leaves a handful of teams trying to avoid being No. 13. * Arkansas-Texas A&M are currently tied and have not yet played head-to-head. For the sake of simplicity, I am pretending that Arkansas has won that series. You can follow the rest of the bracket here (.pdf file). As always, the great challenge of the SEC baseball tournament is that is has the least meaning for the best teams. That’s why taking only eight of 14 teams just wouldn’t work. There would be a good chance that all eight teams would have already secured NCAA berths and thus would be uninterested in depleting their pitching staffs for this tournament. That said, the SEC tournament is still a lot of fun in good years. And Tennessee would really like to get back. The Vols won the tournament three years in a row (1993-1995). Incredibly, they haven’t made an appearance in Hoover since 2007, when they sneaked in as a No. 8 seed. The last time UT was a No. 4 seed or higher was 2005. This entry was posted in UT Athletics and tagged BaseVols, SEC baseball tournament, Tennessee baseball on April 28, 2014 by Evan Woodbery. KNOXVILLE, Tennessee — We’re running our annual review of salaries in the Tennessee football program in tomorrow’s News Sentinel. Subscribers can check out the full story on GoVolsXtra later tonight. There weren’t many changes between 2013 and now, as you can see for yourself in the two charts. Among on-field coaches, there was no change at all. All nine coaches are working under the same contract — and same salary — they had 365 days ago. That jibes with Dave Hart‘s comments during a round of interviews in December. Hart didn’t seem inclined to give raises for assistants who were in the middle of two-year contracts. Of course, things can change if another team comes calling. But if UT’s assistants were shopping for new jobs this offseason, we didn’t hear anything about it. Only one assistant has been given a raise during Butch Jones’ tenure, and that was more than a year ago. Defensive backs coach Willie Martinez signed a new deal on Feb. 10, 2013 that increased his base and supplemental pay from $280,000 to $350,000. About that same time, Martinez added the title of assistant head coach for defense. All the coaches are under contract through Feb. 28, 2015 — essentially, the 2014 season. One-year contracts were once the standard for assistants, but multi-year deals are becoming more routine. Because the last pay cycle in the current contract runs from March 1, 2014 to Feb. 28, 2015, we’ll check again in March to see if there have been any alterations to the deals in place now. This entry was posted in Tennessee football, UT Athletics and tagged Butch Jones, Dave Hart, Willie Martinez on February 13, 2014 by Evan Woodbery. KNOXVILLE, Tennessee — Maybe you’ve seen Tennessee’s new “Bulletproof” video? The five-minute cinematic montage was released on Wednesday and has drawn raves on social media for its incredible production values. This clearly wasn’t a video that you or I could take with an iPhone. So I asked UT video director Barry Rice how it was done. Here’s his answer. * Special cameras: Rice equipped his videographers with Arri Alexa HD cameras used in high-end TV and film production (and probably costing oodles of money). * A strong team: Rice credited Trevor Greene, Erik Peterson and Steve Anderson and others with doing an exceptional job on the film work. “Steve ran all the footage through a color-correct process and I had an audio mix and sound FX session done as well,” Rice said. * A great voice-over: Rice chose former Vol football player and current motivational speaker Inky Johnson to do narration. Originally, there was a script for Johnson to read. This entry was posted in Tennessee football, UT Athletics and tagged Barry Rice, Bulletproof, Erik Peterson, Inky Johnson, Steve Anderson, Trevor Greene, VFL Films on October 31, 2013 by Evan Woodbery. If I don't play next week, im gonna lose my mind! Na ncaa still playing the quiet game @morganc44: please tell us you will be back for Mizz!…….."
N I again I apologize to the Volnation for what I did, but I'm a father first! KNOXVILLE, Tennessee — In a series of Twitter posts made during Tennessee’s loss at No. 1 Alabama, suspended defensive tackle Mo Couch expressed his eagerness to return to the field, but said he had not received clearance from the NCAA. Couch was ruled ineligible on Sept. 12 after Yahoo Sports reported that he was among several current and former players who received cash payments from someone acting as a liaison to NFL agents. Couch and his wife have one child. His wife is pregnant with their second. This entry was posted in Tennessee football, UT Athletics and tagged Mo Couch, NCAA, Twitter on October 28, 2013 by Evan Woodbery. To the amazing fans/vol family-despite hoping and praying there is still no answer/resolution & we do not know when he will play again! KNOXVILLE, Tennessee — The wife of Tennessee senior defensive tackle Mo Couch said there has been no resolution to her husband’s case and no word on when, or if, he will play again. Stephanie Couch tweeted the update on Friday. Mo Couch was declared ineligible five weeks ago after a Yahoo Sports report alleged that he and former UT quarterback Tyler Bray received cash payments from Luther Davis. Davis, a former Alabama football player, was allegedly acting as a “concierge” or intermediary between college players and NFL agents and financial advisers. Tennessee’s only statement on the matter was that the university was investigating the allegations. Couch, who is married with a child, is from Orlando, Fla., and arrived at UT in 2011 after a stint at Garden City (Kan.) Community College. This entry was posted in Tennessee football, UT Athletics and tagged Luther Davis, Mo Couch, Stephanie Couch, Tyler Bray on October 18, 2013 by Evan Woodbery. KNOXVILLE, Tennessee — The Vols had sold (or allocated to students or groups) about 90,000 tickets for Saturday’s game against No. 11 South Carolina as of Thursday afternoon. Neyland Stadium has a capacity of 102,455. Senior associate athletics director Chris Fuller said the early kickoff (the game starts at noon) and the fact that students are on fall break has contributed to the slower pace of sales. South Carolina sold about 5,000 seats from its allotment, he said. UT sold about 3,000 seats to students at area colleges — like Pellissippi State Community College — for $10 to help make up for the absence of UT students this week. This entry was posted in Tennessee football, UT Athletics and tagged attendance, Chris Fuller, Neyland Stadium, South Carolina Gamecocks, tickets on October 17, 2013 by Evan Woodbery. KNOXVILLE, Tennessee — Former Tennessee tennis player John-Patrick Smith and doubles partner Paul Hanley lost to the third-seeded team Saturday at Wimbledon. 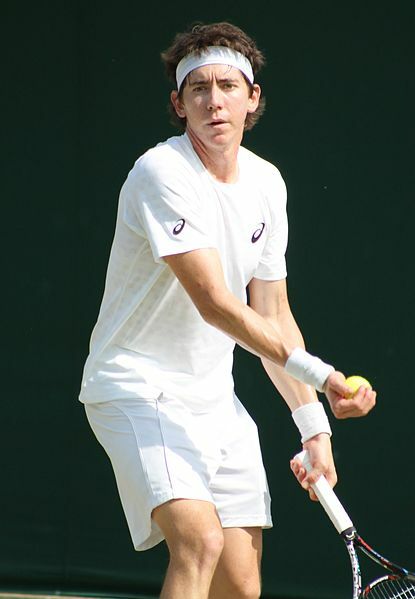 Smith, an Australian who played at Tennessee from 2007-2011, was making his Wimbledon debut. He suffered a five-set defeat 4-6, 6-1, 6-7 (6), 7-5, 10-8. This entry was posted in UT Athletics and tagged John-Patrick Smith, men's tennis, Wimbledon on June 30, 2013 by Evan Woodbery.